It’s well known that many archetypal corporate communications are despised, mistrusted, and disregarded. This is not news but it still happens. We’re talking about the polished CEO message that has become neither meaningful nor sincere, from all of its edits through to release. The enthusiastically written multimedia newsletter that is almost immediately buried in the inbox of death. The well-intended Line Manager cascade process that inevitably succumbs to ‘chinese-whisper’ syndrome within hours. No wonder employee engagement continues to flounder despite the huge budgets that are consumed every year to ‘get it right. 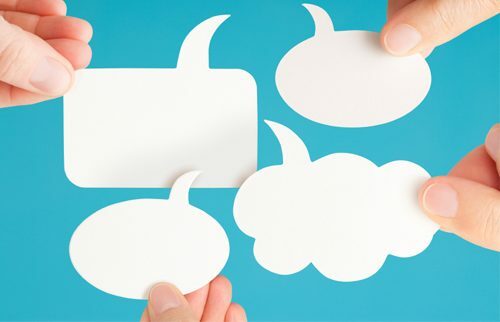 There are, of course, many more modern employee communication approaches now being used – and it’s debatable as to whether they are setting the world ablaze either. The old stuff has to change faster, and the new stuff has to work better. In complex working environments, it is commonplace for people to be working alongside each other while living in different realities. Misunderstandings, biases, assumptions, information gaps – these are some of the things that influence our unique perceptions of the world. We call this ‘the fog’ and it is hugely detrimental to engagement, collaboration, and performance. The more complex the working environment, the foggier it gets. Previously this stuff was invisible, inevitable, unimportant. Now it’s not. People at work create their own sense around for example, what is changing and how it will affect their team, and consequently what it takes to achieve KPI’s. They interpret words, cultural differences, even body language in different ways – often to support their existing ‘sense’. They need meaningful interaction as part of the communication process to make sense of what’s happening in a way that works for them. By reversing the communications process- first asking people (anonymously) in teams how they perceive their world at work, and then synthesizing the data before presenting it back to the team, their real communication needs become abundantly clear. This way, the action is to find out where alignment is needed (to the strategy and themselves), rather than bombarding them with messages based on thinking around what people ‘should’ want to know. This is based on research in the social sciences that tells us that behaviours lead to a better ‘shared reality’ (not necessarily agreement, but to perspectives that are compatible), and both determine team effectiveness. Having studied the literature on collaborative learning, and social and cognitive factors that drive teamwork, we found that teams (bringing together people with different experiences, values and knowledge) are more effective problem solvers than are individuals. However, effective collaboration (problem solving) is not merely a case of putting people with relevant knowledge together. Team members face the challenge of integrating their different perspectives and developing shared cognition (a shared understanding) of the problem at hand. Doing this is driven by interpersonal and socio-cognitive processes and practices (behaviours). These do not occur in a vacuum but are influenced by the social context in which they take place. For our literature review document, please contact us. Often perceptions on the whole team context sit just below the radar. It’s only when people take a step back to look at their active thoughts and assumptions that they become conscious of them – and that’s when they can adapt. When was the last time you were asked which developments in your organization will have a big impact on your team – and what you think your team should do in response? Or if your team members treat each other positively and as equals? Bringing these answers to the surface and comparing them against the views of their team members is interactive and interesting, not just for the facilitator or the manager, but for the participants. Our clients say that by doing this, profound insights come back. Our experience tells us that what matters to people at work is that they are understood and valued. And it tells us that what makes the difference between intent and implementation is a shared current reality – the basis of collaboration, learning, and performance. Is it possible to do ‘reverse communications’ efficiently? Of course, it is. Done in a structured and careful way, using technology in the right places, it’s a data processing / dialogue process that is a much faster track to success than not doing it at all. By starting with what people need to know or share and engaging on those points in ways that make sense, communication moves from being a mess of media to a driver of effectiveness.